This oval panier a jour, or French market basket, was submitted for an exhibit of baskets woven by basketry teachers. Katherine was invited by Joanna Schanz of the Broom & Basket Shop to submit an example of her work for this exhibit at the Philip Dickel Basket Museum and Gallery in the Amana Colonies in Iowa. Each year they have an exhibit to celebrate basketry, and this year’s theme is basketry teachers and their classes across the US. The exhibit will be open from May 24 to October 5, 2009. 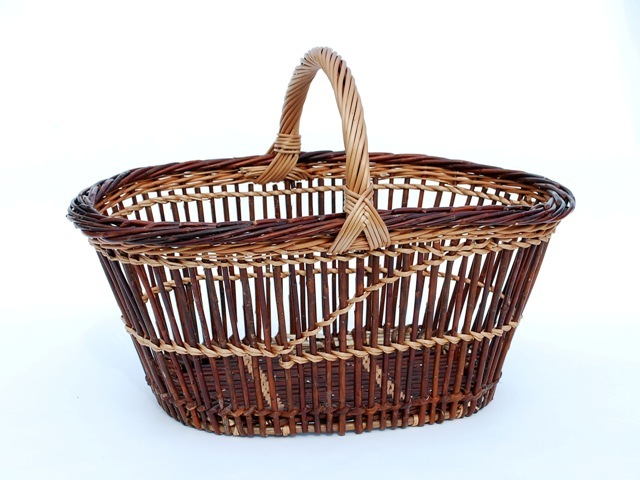 This traditional French basket is one of Katherine’s favorites. 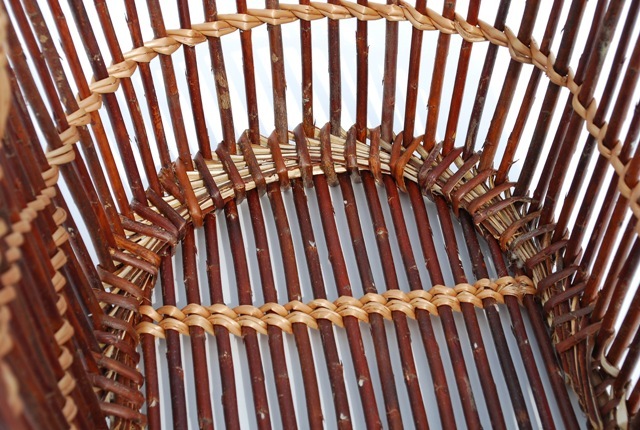 The basket is made using the techniques of scalloming and fitching. In 2006 Katherine traveled to France to spend a week in Villaines-les-Rocher at the Basketmakers’ Cooperative to take a course with Norbert Faure. The oval and square panier a jours were the baskets she focused on with Norbert. Despite her limited French, she learned a great deal. Katherine Lewis is a basketmaker in the Pacific Northwest where she has been weaving willow for seventeen years. She has a small farm near Mount Vernon, Washington where she grows the willow used in her baskets allowing her to choose the quality, color, and texture of her weaving materials. Katherine’s goal is to weave willow baskets that are functional and durable while reflecting the natural beauty of the willows. She has studied with accomplished basketmakers from England, Switzerland, France, and Scotland; including traveling twice to the UK and France to tutor with basketmakers, tour the willow growing areas, and learn more about the willow basketmaking traditions. Her instructors have included Adrian Charlton, Jenny Crisp, Sally Goymer, Norbert Faure, Alastair Heseltine, and Werner Turtschi. An extensive background in traditional European techniques coupled with willow growing has given her the abilities and inspiration to pursue this traditional craft with her own vision. P.S. You can click on the photos for a little larger view. 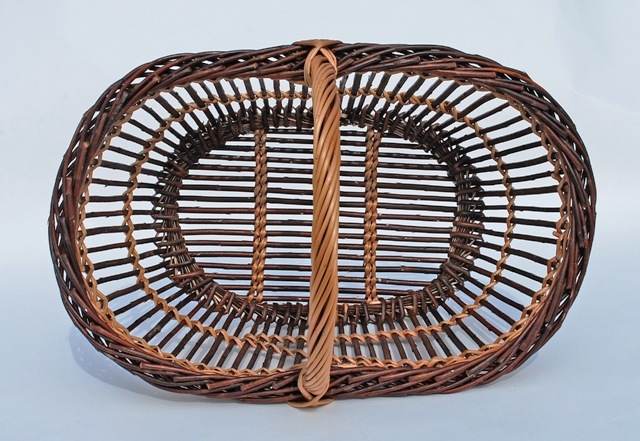 This entry was posted in basketry and tagged amana colonies, basketmaker, baskets, Katherine Lewis, Philip Dickel Basket Museum and Gallery, willow baskets by Steve@DunbarGardens. Bookmark the permalink.